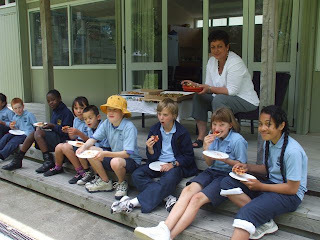 Today 10 children shared a pizza lunch with Ms Heath. Bayden, Caleb, Nevada, Nihmot, Jasmine, Utu, Alex, Yazmin, and Ryan had each earned 10 Green Cards for their consistant great behaviour, and wonderful Addington Attitude. The favourite varieties are Homer Simpson, and the Vegetarian Supreme, which was pronounced 'delicious' and 'very tasty' by Nihmot. The pizzas are sponsored by Filadelfios Pizza in Beckenham. A big "Thank you" to Tony for supporting this programme in the school.